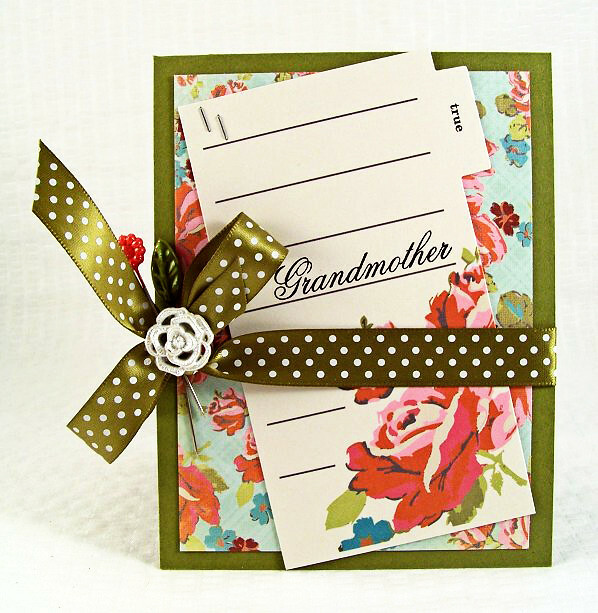 michellephilippi.com» Blog Archive » Grandmother. Posted by Michelle on February 24th, 2012 . Filed under: Cards, Grandparents, Lily Bee . Alright, so today’s card I just adore. I love that Lily Bee patterned paper and pretty rolodex card to go with. Nothing too outside the box, but I am smitten with this one for sure. Enjoy your Friday! Love the colors and the cute little pin! Hope you have a great weekend! Gorgeous. Love the pin & center decoration on the ribbon. Very vintage. Any grandmother would love it. So pretty, I have missed a lot of your cards, your not showing up in my dashboard, hmm. Love this bright card! Have a great weekend! Yes, TGIF for sure! Whew! Am loving the “family” theme you’ve got going and all of your beautiful cards!